A recent New York Times article* last May reported that public company directors are coming under scrutiny this proxy season based on what they are not doing. Based on my experiences with dozens of nonprofit organizations, the litany of complaints cited in the Times article, can easily apply to nonprofits, whether they are professional organizations, trade associations, educational institutions or charitable organizations. Monitoring Risk Management – Many conservative nonprofits don’t seem to recognize the need for risk management reviews at the board level. Having physical facilities to protect, clients who can sue, and operations that are subject to closure during freak weather conditions (e.g., hurricane Sandy) are reasons enough for nonprofit directors to have serious risk discussions. Based on reviews of systems and insurance coverage, the board has to be in a position to take leadership to maintain some types of continuing operations. I encountered one situation where an NFP board, operating for 17 years, never had Directors and Officers liability insurance coverage, although the board was responsible for $24 million in real estate assets, had an operating budget circa $400K annually plus a reserve fund of $700K. When finally seeking D&O coverage, the board rigorously debated the difference between one and two million coverage, a difference of about $700 in premiums each year! Chief Executive Succession Planning – First when a new CEO is engaged, plans should be in place to name an interim CEO, should the CEO have a serious personal crisis. Second the board needs to be thoroughly briefed on potential internal successors should the CEO resign abruptly. Also is there a need for a CFO succession plan? It has been reported that hiring external talent is three to five times as costly as naming an internal candidate to the top position. Since financial issues are usually key items for nonprofits, perhaps promoting an internal candidate can be the more expedient decision. When it comes to making succession decisions, boards typically can be penny-wise and pound-foolish. In any event, a NFP board is responsible for maintaining a strong talent pool as possible for the organization. Assessing CEO and Organizational Performance – Most nonprofit chief executives and their organizations are evaluated on an annual basis, using financial and other internal metrics such as employee turnover and membership retention. Since nonprofit organizations are mission driven, qualitative information needs to be added to the mix. http://bit.ly/OvF4ri These can range from data on community impact to valuing partnership outcomes with other nonprofits. The metrics should be mutually negotiated between the board and CEO, while some metrics need to be evaluated over longer performance periods. A few business firms use a four year or five years performance period when establishing CEO compensation. 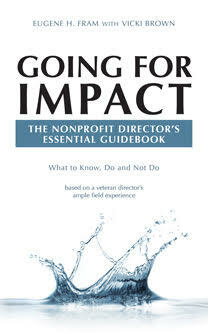 Summary – Most nonprofit directors are not compensated for serving on boards. In addition, their board terms are relatively short (3 to 6 years) when compared with those serving on business boards. Consequently, they often don’t do what is needed in terms of monitoring risk management, succession planning and robustly evaluating the CEO and organizational performance. Like commercial board directors, nonprofit board members need to become aware of the possible deficits in the three areas. Otherwise, individual board members might find themselves financially liable for what appears to be an innocuous action. *Gretchen Morgenson (2013), “Directors Disappoint by What They Don’t Do,” New York Times, May 11th. ← Is Your Nonprofit Forward Focused or A Prisoner of the Past?